Moussa Traoré was born and raised in Mali, West Africa. Moussa has been playing the djembe for the past thirty years. In 1984, after completing a twelve-year apprenticeship, he was deemed a “master” by his teacher, Sega Cissé. From 1984 to 1990, when the competition ended, Moussa was selected every time to represent the region of Bamako in Le Biennal, the national competition of artists from every region in Mali. Each competition, Moussa led his group to win the highest honors. Moussa has achieved great recognition throughout Mali as an accomplished musician in the theater, in traditional ceremonies as well as in the Malian pop music scene. 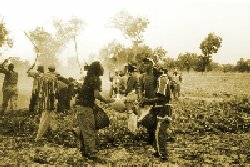 Moussa performs the rhythms of a number of Mali’s ethnic groups including: the Bambara, Malinké, Dogon, Bobo, Bozo, Minianka, Sorghai, Soninké and Khasonké. Among musicians in Bamako, Moussa is considered to be one of the top djembe players in the country. In 1984, Moussa began playing djembe with his first theater troupe, Troupe Babemba. From there he went on to play with several Malian theater troupes including: the Ballet National de Mali, Troupe District de Bamako, and Troupe Sewa. 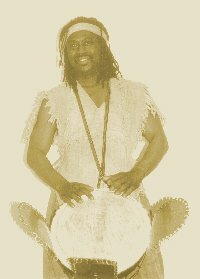 From 1986 to 1998, he was the lead drummer of Troupe Komi Djossé in Bamako, Mali and from 1994 to 1998 he was also its director. Moussa brought the troupe to national recognition through their music video entitled, “Ti Samba,” in which Moussa is featured as lead drummer and vocalist. appearances with Malian singer Oumou Sangare, as well as blues legend, Taj Mahal and his group Kulanjan as part of the Africa Fete tour. In addition to his extensive performance and recording career, Moussa has established himself as an internationally respected teacher. In 1998, he was invited to France by La Nef des Musiques, a nonprofit organization endorsed by the French Minister of Culture that provides arts in public schools. Moussa worked as an “artist in residence” in schools in the south of France teaching students the traditional music of Mali. His teaching experience has also included working with several European apprentices who have studied djembe, dundun and drum-making with him in Bamako, Mali over the past ten years. 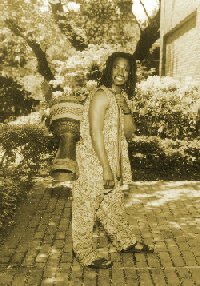 Since moving to the U.S. in 1998, Moussa has given drum workshops in cities throughout the U.S. including: Oakland, CA, Palo Alto, CA, Philadelphia, PA, Denver, CO, Detroit, MI, Salt Lake City, UT, and Saint Louis, MO. Moussa has also taught and performed at several colleges including Brown University, the Rhode Island School of Design, Connecticut College, and UC San Diego. Currently, he is teaching after school programs at several schools in the area, teaching weekly community classes, and advanced drum classes.